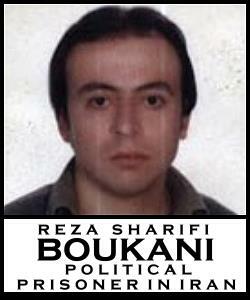 A Letter from Reza Sharifi Boukani, Political Prisoner Under Unofficial Sentence of Death in Iran. Reza Sharifi Boukani is a political activist and political prisoner detained by the Islamic Republic under death sentence,* most recently in Rajaei Shahr prison. He was originally charged with “conspiring against the regime.” On December 26, 2010, Boukani was informally (verbally) charged with other false accusations, including giving order to plant bombs at Amir Almomeni Mosque in September 86. The judge in his case, Mir Rafari, told him “we are going to kill you.” On December 27, 2010, Reza Sharifi Boukani, along with Ali Saremi, was removed from Rajaei Shahr prison to an undisclosed location. Saremi was executed on the morning of December 28, 2010 by the Islamic Republic at Evin Prison. Below, we present a letter that was written by Boukani in the summer of 2010, detailing his arrest, detention and torture by the Islamic Republic’s agents. Below Boukani’s letter, we have included a sample letter to the UN High Commission for Human Rights that you can use to urge immediate action to the case of Boukani and all political prisoners. Do not wait to send this mail – it may soon be too late. Reza Sharifi Boukani, Political Prisoner, Imprisoned in Rajaei Shahr Prison Since May 5, Detained by IRGC-Information. I, Reza Sharifi Boukani, was born in the town of Boukan, residing in Tehran. After 11 years of service in the path of democracy and political activity in Iran, with the single objective of serving Kurdish people, attaining freedom of Kurdistan, and attaining democracy in Iran, I was arrested by forces of the Information Ministry in a internet cafe in Shahrak Ghahrb (Daneshjoo Internet Cafe) on May 5, 2010, at 4:30pm. In the beginning, I was taken to an unknown place and left alone until the morning. At 9 o’clock in the morning, I was physically tortured and severely abused. After 3 hours of being very unjustly humiliated, I was taken to a court without knowing which court, because in addition to being blindfolded, they had covered my head with a sack. I was forced to lie in the back seat of a car, and my hands were cuffed behind my back. This journey was torturous until we got inside the court, and I didn’t see any of those who were present (because I couldn’t see anything). From the first minutes in front of the judge, they called me a spy and an enemy of the regime, and signed an order of a month’s detention. I was then immediately transferred from the court to Rajaei Shahr, to the IRGC’s ward. The same procedure of blindfolding and handcuffing was followed from the court to the prison, but this time, my ankles were shackled. I was kept in a solitary confinement cell that had a toilet, and I was kept there between 15-20 days under psychological and physical pressure. Every day at 6:00 I was questioned by the officials of the IRGC’s Information Deputy. After 15 days, i.e., the 27th of May 2010, I was again taken to a court, and from there to a place close to the mountains of northern Tehran. I later understood that this place was located in Lavasan. I was under torture for exactly 5 days. I was blindfolded during all of these interrogations. I was threatened, frightened, and sometimes roughed up while being interrogated. From there I was secretly removed to Ward 209 and put in cell 77; I was kept in solitary confinement for 65 days. Every day, I was interrogated and pressured. About my physical tortures there, I must say that beatings and electric shocks were the usual tortures against me. I was hung [from my arms] for 48 hours and as a result unfortunately my left arm does not function and I cannot use it. I was under the harshest interrogations in Ward 209 every day. They changed their manner of interrogation constantly, and new interrogators were introduced. The Information Ministry’s interrogators, when they could not find any evidence against me, pressed me hard to get my email, and they fabricated documents against me. After 5 months, a person from the Ministry of Information and another one from the IRGC’s Information, called me in, and this time without being blindfolded, told me about a television interview, and asked me to say lies according to their demands. In these “interviews,” they wanted me to confess against myself and incriminate others. I of course did not accept this and refused. In the last days before, I was transferred to the lower floor, and they had a film crew. Again I refused, and for this, they threatened me with capital punishment. On the 15th of July, I was again handcuffed and blindfolded, put on the back seat of a Samand vehicle and transferred to Rajaei Shahr, IRGC Ward. I was kept there for 6 hours, and then was transferred to Ward 2. I was kept in the harshest situations, where the overcrowding of people destroys the nerves of a human being, and even for the most primitive things, like bath and toilet, communication, or buying from the shop, one had to wait for half a day in a queue. The principle of separating [prisoners according to their] crimes, which is emphasized so much by the officials of the judiciary in the prison, is not carried out here, and I and another political prisoner, Behrouz Javid Tehrani, are among murderers, armed robbers, and cons. We have very limited access to telephone, and participation in Quran lectures, group prayers, and fasting are mandatory. Despite all of this, we will resist in this prison, in the hope of a just court and achievement of minimum legal rights. * NOTE: Reza has not officially had an execution sentence handed down to him; however, unofficially, he has been told on more than one occasion that he is to be executed, and this is how he has communicated the status of his case to the International Committee against Execution. Source: International Committee against Execution, personal communication. I am writing to you with an urgent request that you issue a demand for the Islamic Republic to immediately and unconditionally release all political prisoners in Iran, with specific urgent attention to the case of Reza Sharifi Boukani, a known political prisoner who was removed from Evin prison to an undisclosed location with another political prisoner, Ali Saremi on December 27. On the morning of December 28, Saremi, age 62, was executed. There is considerable fear that the Islamic Regime will also execute Boukani imminently. I fully expect the United Nations to take immediate action on the cases of Reza Sharifi Boukani, Habibollah Latifi, and all other cases of political prisoners in Iran. People of the world do not accept the continued detentions, tortures and executions perpetrated by the Islamic Republic, and we do not tolerate the UN’s refusal to act substantively in these matters. خبرگزاری هرانا – رضا شریفی بوکانی، یکی از زندانیان محبوس در زندان رجایی شهر کرج است که از پانزدهم اردی بهشت ماه تاکنون به صورت بلاتکلیف در زندان به سر می برد. رضا شریفی بوکانی زندانی سیاسی محبوس در زندان رجایی شهر که از 15 اردی بهشت در بازداشت اطلاعات سپاه پاسداران بسر می برد اینجانب رضا شریفی بوکانی متولد شهرستان بوکان محل اقامت تهران پس از یازده سال خدمت به راه و ریشه دموکراسی و فعالیت سیاسی در ایران که تنها هدفم خدمت به ملت کرد و آزادی کردستان و دموکراسی در ایران بود 15 اردی بهشت 89 ساعت 4:30 در یک کافی نت در شهرک غرب(کافی نت دانشجو) توسط نیروهای وزارت اطلاعات بازداشت شدم. در ابتدا مرا به مکان نامعلومی بردند و تا صبح با من کاری نداشتند صبح ساعت 9 بود که مرا شکنجه جسمی کردند و بسیار آزار و اذیت نمودند بعد از 3 ساعت با فضاحت و بی عدالتی مرا به دادگاهی بردند که متوجه نشوم کدام دادگاه بود چون غیر از چشم بند یک گونی کوچک را بر سرم انداخته و از همانجا مرا روی صندلی عقب دراز کشاندند و از پشت به من دستبند زدند. من عذاب زیادی کشیدم تا وارد دادگاه شدم و متاسفانه متوجه هیچ شخصیتی در آنجا نشدم چون نتوانستم چیزی ببینم. در حضور روئسای دادگاه در همان دقیقه از من به عنوان جاسوس و دشمن نظام نام بردند و قرار بازداشت یک ماه را محرمانه امضا کردند و بلافاصله از دادگاه من را به رجایی شهر بند بازداشتگاه سپاه آوردند. از دادگاه نیز به همین شکل چشم بند و دستبند داشتم و اینبار پابند هم اضافه شد که بی نهایت دچار اذیت و ازار شدم. من در سلول انفرادی ای بودم که یک توالت فرنگی هم آن جا بود و نزدیک 15 الی 20 روز زیر فشار روحی و جسمی قرار گرفتم بودم؛ هر روز 6 ساعت توسط مسئولین معاونت اطلاعات سپاه پاسداران تحت بازجویی قرار می گرفتم. بعد از 15 روز یعنی 6/3/89 دوباره مرا به یک دادگاه بردند بعد از آن مرا به یک مکانی که در نواحی کوهستانی تهران بود، انتقال دادند و بعدها متوجه شدم در مناطق لواسان است. دقیقا 5 روز زیر شکنجه قرار گرفتم. من در تمام این بازجویی ها با چشمبند بودم و مرا با تهدید و ارعاب فراوان و گاهی با خشونت بازجویی می کردند. بعد از آنجا مرا به ساختمان 209 محرمانه انتقال دادند و در سلول 77 به مدت 65 روز در انفرادی به سر بردم و هر روز بلااستثنا بازجویی داشتم و تحت فشار قرار می گرفتم. در مورد شکنجه های جسمی که من آنجا متحمل می شدم باید بگویم که ضرب و شتم و شک الکتریکی از شکنجه های معمولی بود که برای من استفاده می شود، درست 48 ساعت مرا آویزان نمودند که الان متاسفانه دست چپم از کار افتاده و کارایی خود را از دست داده است من در ساختمان 209 هر روز تحت شدیدترین بازجویی ها قرار می گرفتم و هر روز شیوه بازجویی ما تغییر می کرد و بازجوی های جدیدی می آمدند بازجویان وزارت اطلاعات پس از انکه هیچ مدرکی علیه من پیدا نکردند از طریق فشارهای فراوان پسورد ایمیل مرا تهیه نمودند و اینگونه اقدام به سند سازی علیه من کردند. بعد از 5 ماه شخصی از وزارت اطلاعات و دیگری از اطلاعات سپاه پاسداران من را احضار نمودند و بدون چشم بند در مورد مصاحبه تلویزیونی که من دروغ های را به نفع آن ها به نمایش بگذارم با من صحبت کردند؛ من باید در این مصاحبه علیه خود و کسانی که نمی شناختم صحبت می کردم ولی بنده حاضر به این کار نشدم و جواب رد دادم. روزهای اخر بود که مرا به طبقه پایین بردند و کل تشکیلات فیلم برداری را راه اندازی کرده بودند و من دوباره قاطعانه جواب رد دادم به همین دلیل آن ها مرا به اشد مجازات تهدید نمودند.24 تیرماه بود که مرا چشم بسته و دست بند به دست روی صندلی عقب ماشین سمند خواباندند و به رجایی شهر بند سپاه آورند انجا به مدت زمان 6 ساعت ماندگار شدم بعد مرا تحویل بند 2 زندان رجایی شهر دادند که به من اخطار دادند که به سایر زندانیان و پرسنل حتی جرمم را هم نگویم در بند 2 مرا درسخت ترین شرایط در حالی که ازدحام جمعیت اعصاب و روان انسان را به مختوش می کند که برای ساده ترین کارها مانند حمام و دستشویی و مخابرات و خرید از فروشگاه باید حداقل نیمی از روز را در صف منتظر باشیم نگهداری می کنند. اصل تفکیک جرایم که مسئولین قوه قضاییه سازمان زندان ها انقدر بر ان تاکید می کنند، به فراموشی سپرده شده و مرا به همراه زندانی سیاسی بهروز جاوید تهرانی در بین قاتلین و سارقین مسلح و کلاه برداران نگهداری می کنند. امکان استفاده از تلفن برای ما بسیار محدود است و شرکت در کلاس های قرآن و نماز جماعت و هم چنین روزه گرفتن برای همه ما اجباری می باشد. معهذا هم چنان در آرزوی محاکمه عادلانه و به دست آوردن حداقل حقوق قانونی خویش در این زندان استقامت خواهیم کرد.